With 24 extra minutes of action-packed, effects-laden scenes not seen in theaters! A multi-layered adventure unfolds as scenes from the graphic novel make the leap to film. In an alternate 1985 United States, superheroes are part of the fabric of everyday society. When one of his former colleagues is murdered, the outlawed but no less determined masked vigilante Rorschach sets out to uncover a plo… t to kill and discredit all past and present superheroes. 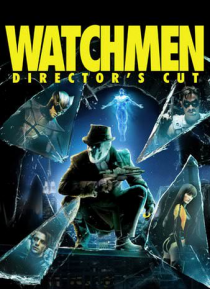 Their mission is to watch over humanity... but who is watching the Watchmen?